The Sharif family during Ramadan, before dad Bablu Sharif was detained by ICE. 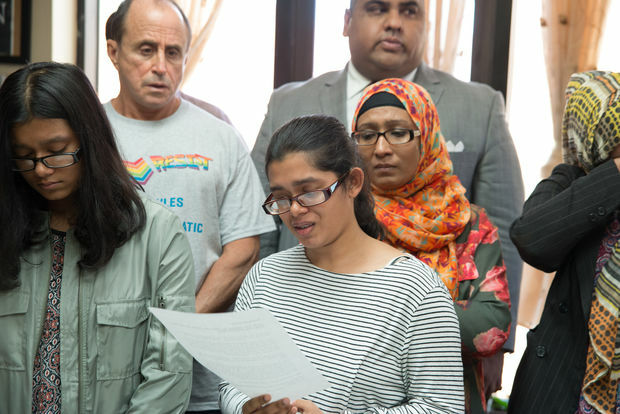 JACKSON HEIGHTS — The teen daughters of a Bangladeshi man awaiting deportation at a detention center thousands of miles from Queens on Tuesday held a news conference to beg the president to bring him back home. 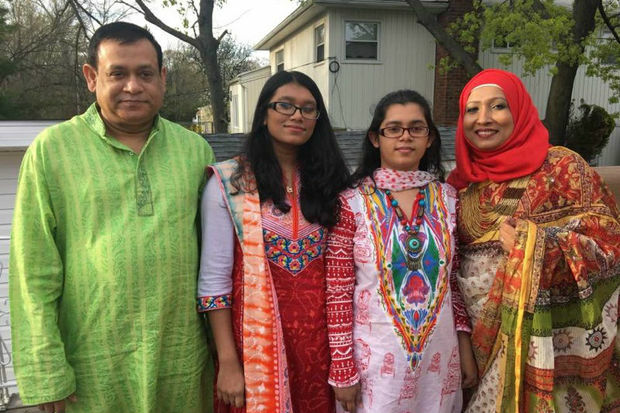 Simran Sharif, 18, and her sister Samiha, 14, wept inside their Jackson Heights tutoring center as they pleaded with President Donald Trump to not to deport their father, Bablu, back to Bangladesh. The 52-year-old Uber driver moved to Woodside in 1992 with a political asylum application, but fell off with keeping up with his documentation, his daughters said. "I love my dad very much," his youngest daughter said, surrounded by family and advocates. She's a freshman at Hunter College High School and hopes to one day go to Harvard University and become "the best lawyer in this country." But she worries about who will take care of her family with her dad gone. Her mother is sick and unable to work. "Who will take care of us if my dad is deported?" she said. Sharif was first detained by Immigrations Customs Enforcement in 2013 but released on a deferment because of his daughters' ages and legal status, the family said. He was granted a work visa and has recently worked as an Uber driver, his family said. Since then he checked in with ICE yearly to renew his work permit — until his most recent visit June 22, when he was detained at the federal agency's Manhattan office. He was first brought to a facility in Hudson County, New Jersey, but later transferred to ICE detention centers in Louisiana and Arizona. And he's been at the Florence, Ariz. ICE detention center since September, where he calls as much as he can, crying for his daughters, they said. "We've been living with the American Dream until June 22, 2017," his eldest daughter said. She's a senior at the Academy of Finance and Enterprise in Long Island City and dreams of being a doctor — but she's lost interest in school. "I don't want to go to school any more, my mom and sister cry all the time for my father," she said, breaking down in tears. "I cry also, but I do not want to cry in front of my sister. I don't want to cry in front of anyone, because then people will not think I am a brave girl." Ali Najmi, a lawyer and the political action director of the Alliance of South Asian American Labor, said Sharif doesn't have a criminal record and was a tax-paying dad. He hoped to apply for citizenship when his daughters were old enough to sponsor him. "This is an American family that is being broken apart by an inhumane policy," he said. Although they'd had support from elected officials, including Sen. Kirsten Gillibrand, Sharif is being told he'll likely be deported soon — and they hoped an appeal to the president could work. An email to ICE representatives seeking comment was not immediately returned. Meanwhile the Sharif family said they are getting by with help from friends and family — but fearful of what comes next. "This is my country and I'm very afraid," Simran Sharif said. "I'm afraid what's going to happen to my little sister and me if my father does not come back home."